I´m trying to draw a simple cube using Tee Chart 7 with an object of type TSurfaceSeries and the method AddXYZ, just informing the vertex of the cube. The result is strange. Is there any simple sample to teach me how to do that? the best way to draw a Cube is by using the TChart.Canvas Cube, Cylinder, Sphere methods to manually draw these objects directly on TChart.Canvas. 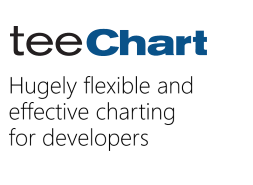 I there's one example of this in the Demo Features project, included into the TeeChart Pro installation. In deed, what I want to do is to draw a wireframe 3D grid and then, using the features avaiable in TC7, switch the visualization mode to Surface, Surface Nearest and back to wireframe. The wireframe is the result of several blocks (cubes) drawn one besides the other. If I draw one by one using the TChart.Canvas routines I will not be able to use the Surface and Surface Nearest features without having to convert the grid to the new format. Because of this I would like to start to draw using TC7 since the beggining. Below I send the wireframe drawn in other language.